Brigitte Bardot in one of the gingham dresses she helped to popularize.. Fashion and the French New Wave have long enjoyed a mutual, and creatively productive, infatuation. Later we’ll explore the specific styles and influences of different starlets, but first it’s important to understand that the Nouvelle Vague was not just about the films it produced – it was also deeply enmeshed in the 1960s' "explosion of youth". Undeniably, its original popularity was due in no small part to the new youth music and new youth fashion movements of the time which found in the early New Wave films a sympathetic and harmonizing voice. And, like blobs of paint on a painter’s palette, the actors and directors of the Nouvelle Vague also used the contemporary mood to colour their mis-en-scene and create new atmospheres that reflected the era’s growing feeling of freedom. An ad for Ayako (former NARS International Makeup Director)'s 2010 Le Mepris makeup collection. As discussed in our other articles, for many French New Wave directors the “look” of a film had become just as important – if not often more important – than the stories the films told. Which is not to say that style was ever prioritized over substance - rather, the notion that style itself could be a kind of substance was one that helped to bind the Cahiers directors together early on. It seems natural then, that fashion and the French New Wave go hand in hand. Further, one has only to look at pinup pictures of Anna Karina, Jeanne Moreau, and Brigitte Bardot to understand that the French New Wave helped to create a look that would define a generation. The fashion world took notice of these starlets' unique styles, even then: Louis Feraud was made famous dressing Brigitte Bardot, iconic 60s photographer David Bailey has cited the French New Wave as his main inspiration, and Pierre Cardin fell very literally in love with Jeanne Moreau. 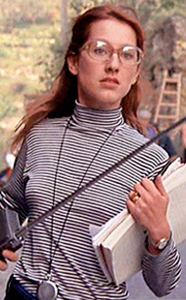 Meanwhile, the films' costume designers, under the direction of their auteurs, happily pilfered Mary Quant style mini-skirts, thick winged eyeliner, and stuffed bright geometric Courreges-like patterns and colours into their actresses' wardrobes. Any catwalk or magazine spread can give you an image of style, but a film could imbue it with an attitude and a living personality. Godard, Truffaut, Bardot, Karina, and many others from the French New Wave, took the styles of the day and instilled in them a lasting anarchic, free, and playful spirit. More than that, they gifted each look with their own personal force. Pixie haircuts, striped shirts, and clamdiggers became Jean Seberg walking along the Seine in Breathless. Brigitte Bardot was gingham dresses and a St. Tropez bikini. 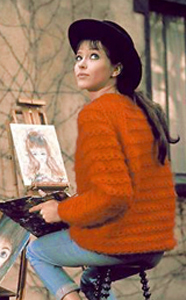 Just as cat-like black eyeliner and brightly colourful frocks were Anna Karina. They still are. Jason Wu has said the French New Wave was the inspiration for his sold out 2012 collection for Target. Today, the looks the French New Wave created still resonate, and many designers and brands are still capitalizing on the movement's timeless appeal. In fact, at least two modern fashion labels are named for films of the new wave: Band of Outsiders, Scott Sternberg's preppy/vintage/eccentric brand, and Alpha 60, the Australian boutique streetwear brand. And French New Wave-inspired clothing is still a perennially cool choice for catwalk collections across the world from high street to red carpet. Agnes B's Fall 2007 collection directly referenced Godard-era Anna Karina (you can read more about this collection on the Anna Karina fashion page below). In 2012, Jason Wu released his highly anticipated collection for Target, stating inspiration from none other than the French New Wave. 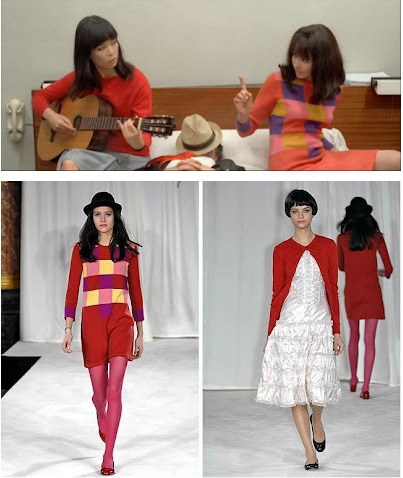 Agnes B borrowed Anna Karina's Godard-era clothes nearly stitch for stitch for her Fall 2007 line. Victoria Beckham's 2012 denim range was celebrated by a French New Wave-inspired short film by Quentin Jones. Marco Zanini, creative director of Rochas, cites Anna Karina as a main reference and claims Vivre Sa Vie as one of his favourite films. Then there's Kate Spade's Fall 2012 line. Marc Jacobs menswear. Jimmy Choo's Anouk Aimee-inspired 2012 clutch. Sonia Rykiel, Whit, Orla Kiely, Christian Dior, Proenza Schouler, Milly by Michelle Smith. Even quirky Parisian line MyPetsQuare, the list goes on. 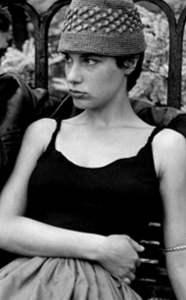 Beauty brands, not to be outdone, also regularly reference the French New Wave. 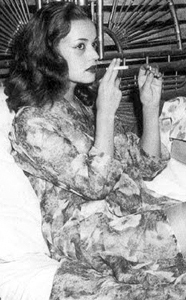 Chanel released a nail polish called Nouvelle Vague in Summer 2010 which is redolent of the shocking candy sky blues used in Godard's Pierrot Le Fou or Truffaut's Baisers Voles, and their "Rouge Allure" lipstick campaign featured an ad meant to look like a Bardot poster for Le Mepris, as well as an accompanying Bardot-esque film! Makeup brand Ayako, run by the former NARS international makeup director, in 2010 released their Le Mepris collection of eyeshadows, blush, and lipsticks, inspired by Godard's film. Not to mention the countless Bardot, Karina, and Deneuve makeup and hairstyle tutorials on YouTube, perfume, and Deneuve's MAC Beauty Icon status! Thus it seems a natural progression that actresses like Drew Barrymore, Jennifer Lawrence, Carey Mulligan, and Alexa Chung are often found sporting New Wave-esque hairstyles, makeup, or clothes. 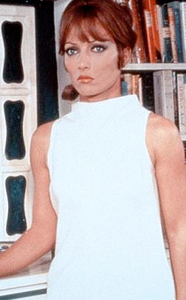 Or that the fashion world now has a crush on models who look like Brigitte Bardot. 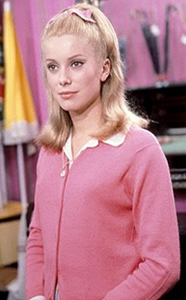 But while the description “French New Wave” is often used in fashion magazines to broadly refer to a group of colours and styles that defined the films of the era, however in terms of womenswear there are generally four actresses whose unique styles - in both films and life - they often really mean. They are: Anna Karina, Jean Seberg, Brigitte Bardot, and Catherine Deneuve. Not only have these four have been muses for designers in both past and present, they are also style and beauty icons whose names are used as shorthand to lend caché to anything from coloured tights and mini dresses to hairbands, perfume and eyeshadow. We've broken down each of their individual styles below, and as a bonus we’ve also added four additional actresses who are often overlooked but whose styles are just as remarkable and worthy of attention! Maybe you can start the next French New Wave trend? Just don't forget to email us the pictures! Click on the image of each actress below to read more about her style, including lists of looks, clothing and makeup tips, and plenty of references to help you recreate their looks.